It was obvious that something was off in the Eagles’ locker room the minute it opened. There was a tension that seemed out of place, even for a team that had just dropped its eighth straight. Some employees and players appeared on edge. When an emotional Derek Landri entered the room, he was instructed not to say a word. Trent Cole stood by him at his stall, almost protectively. The defensive line was gathered close. Andy Reid didn’t want to go into full detail, but he made it pretty clear Monday afternoon that Jim Washburn’s firing had to do with more than just the defensive line’s inability to get to the quarterback. When answering a barrage of questions about what exactly is going on with the Eagles’ defense right now, Todd Bowles made it clear that his players are failing to properly execute the simplest of assignments. LeSean McCoy doesn’t like to take a breather. He’s played 610 snaps on the season, the most of any running back in the NFL, according to Pro Football Focus. McCoy led the league in playing time last year as well. But on Monday night, the Eagles will see what life’s like without McCoy, as the running back continues to recover from a concussion he sustained during the final two minutes of last week’s loss to the Redskins. McCoy just turned 24 in July. He’ll continue to carry the load for years to come. 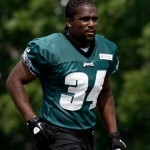 But it’s still important for the Eagles to find the right back to complement his talents. Nnamdi Asomugha had a candid session with reporters Friday, discussing the disappointing start to his time in Philadelphia and the possibility that it could be cut short. 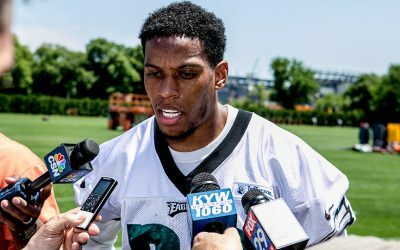 Though things have gone different than anticipated, the much-hyped cornerback says he is not planning his exit strategy out of Philadelphia. “I definitely feel that I have assimilated into it and acclimated into it and all of that stuff,” said Asomugha. “I have gotten the question throughout this year a couple times: did I make the right decision [coming here], should I have gone [somewhere else]? And that doesn’t cross my mind at all. It’s always, yes, this is the place I want to be. Through six games, the Eagles’ pass defense looked like a much-improved unit from the one that took the field in 2011. That’s why when Andy Reid decided to fire Juan Castillo and promote Todd Bowles, it made sense on some levels. Bowles, after all, was the man in charge of the secondary. At the time, the Eagles led the league in opponents’ completion percentage (52.7) and were tied for the second-best mark in yards per attempt (6.2). Results have not been so good in the last two games, as the Eagles have allowed five touchdowns and come up with no interceptions. Matt Ryan and Drew Brees did whatever they wanted, completing a staggering 76.8 of their passes while averaging 8.9 yards per attempt. So what’s been the problem? The defense allowed 21 points per game under Juan Castillo through the first six weeks of the season. Over the past two weeks under Todd Bowles, the edge has dulled and the unit has yielded 26 points per game. They gave up 763 yards of offense in that span and have not generated an interception. 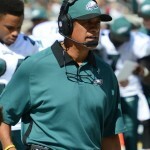 Most Eagles players insist that the approach has not changed much at all since Andy Reid decided to make the switch at defensive coordinator. But their instant regression — particularly in the secondary — cannot be pure coincidence. Turns out, the defense is working through some things as a result of the move to Bowles. Plenty of Eagles players went on the record after Sunday’s game, voicing their frustration and displeasure with the team’s performance against the Falcons. 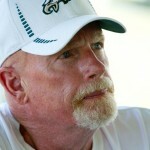 Tim included thoughts from LeSean McCoy and Cullen Jenkins in the Wake-Up Call (definitely worth a read). 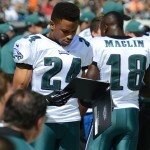 And Nnamdi Asomugha and Dominique Rodgers-Cromartie voiced their opinions as well. But one defensive player chose to speak anonymously to Jason Cole of Yahoo Sports. Todd Bowles wants to free up the Eagles’ pass-rushers, but he’s not overly concerned that the team has zero sacks in the last three games. Several players this week have suggested that Juan Castillo‘s defense was predictable, and therefor vulnerable in the fourth quarter when the opposition deciphered what was coming. Though it may have some truth to it and even come from a good place, it sure can sound like blame-shifting after a while. As in, Juan was the issue and the issue is gone, so we can now realize our potential with Todd Bowles at the helm. Not everybody is on board with the notion that Castillo was a hindrance, or buying into the “predictability” line of defense when rationalizing back-to-back fourth-quarter lapses. There were varying degrees of willingness to talk about the Todd Bowles/Juan Castillo shake-up in the Eagles’ locker room Monday. Jason Babin, for example, has never been more skittish about a subject in his two years in Philadelphia. Others forced you to read between the lines. There were a few revealing moments, however. The biggest one came from backup linebacker Casey Matthews, who relayed Bowles’ message to the defense upon taking the reins. “The biggest thing he said is, ‘We’re not going to predictable anymore.’ That’s what Coach said,” Matthews revealed, the obvious implication being that the ‘D’ was predictable under Castillo. Last Sunday, after the Eagles fell to the Lions, Nnamdi Asomugha addressed reporters at his locker. The Birds had shut down Calvin Johnson and the Detroit offense for three quarters, but collapsed in the fourth quarter and overtime of a 26-23 loss. Asomugha seemed to question Juan Castillo and some of the calls that were made at the end of the game. But today, he said that wasn’t his intention. Here’s a breakdown of what we saw from the coach’s tape in what ended up being Juan Castillo’s final game as coordinator. Given everything that’s happened this week, and because it’s the bye, now is a good time to assess the state of the Eagles. 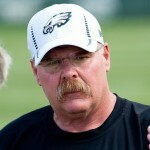 From Marty Mornhinweg to Andy Reid to Michael Vick, here are three thoughts on the Birds.